Mulberry leaves (also known as white mulberry or Morus alba) have traditionally been consumed for their medicinal properties as a highly palatable and digestible beverage or health food. Mulberry leaf contains 1-deoxynojirimycin (DNJ) which may inhibit the activity of a digestive enzyme for sugar absorption, promoting slower absorption of glucose into the blood vessels*. Scientists have demonstrated that mulberry leaf is the new “super food” for maintaining healthy blood sugar levels*. Honso® Mulberry Matcha Tea contains mulberry leaf extract, green tea (matcha) and dietary fibers that maintain healthy blood sugar and promote anti-oxidation*. 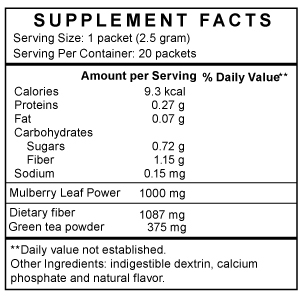 Now everyone can benefit from this naturally derived leaf in our convenient and delicious Mulberry Matcha Tea! Simply open individual packet of tea, dissolve into warm or cold water and enjoy a soothing hot tea or refreshing iced tea with meal to reduce the rise in blood sugar that can occur after a meal*.